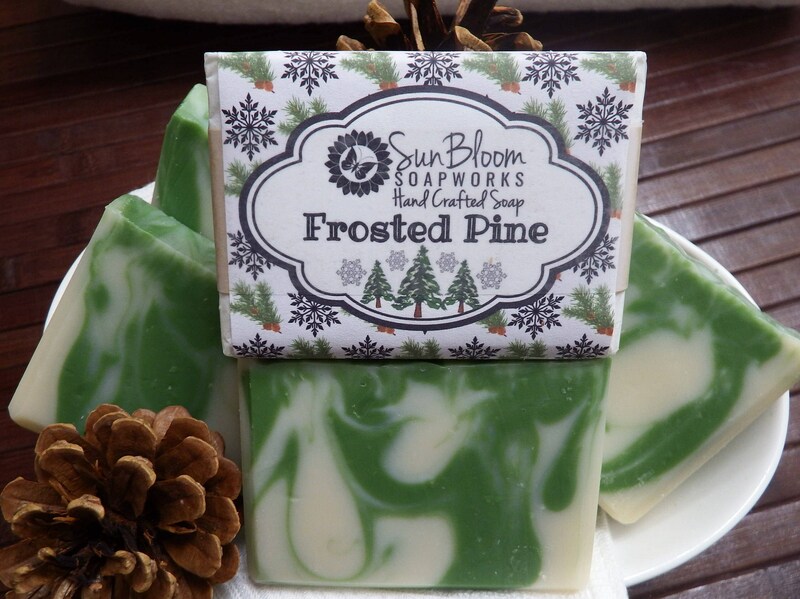 "Frosted Pine" soap is brisk, woodsy and fresh - a holiday favorite! CONTAINS: Coconut Oil, Palm Oil*, Canola Oil, Olive Fruit Oil, Water, Lye, Castor Seed Oil, Sunflower Oil, Grape Seed Oil, Avocado Oil, Sodium Lactate, Fragrance, Mica Colorant. Bars weigh approximately 4oz each at packaging. Smells just as good as I had hoped!!! So so happy to have found this scent in this shop! GREAT product! Smells wonderful and ships fast. Angelina was so helpful with my order and even made special labels! Absolutely fabulous! This soap is so luxurious! Feels wonderful on your skin!